Showing results for tags 'hoop'. It is the famous believe that each people have his or her own angel who protects him from any troubles and save in dangerous situation during the entire life. You may bring to your child, relative or friend this small talisman — the picture of little angel girl at the hand of somebody huge and kind. Angel in the palm machine embroidery design on bag or clothes will help them to avoid any hardships. This picture shows the process of work on Star angel machine embroidery design. The embroidery sample is almost ready but the author still need to remove the transparent plastic cover and free the work piece from the hoop. 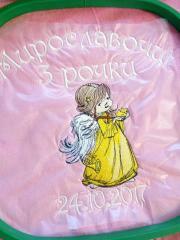 The center of the composition made by Наталья Карпович is the figure of little angel girl with huge wings behind the back. She wears long yellow dress and keeps the bright golden stars in the hands. This is piece of jeans fabric decorated by portrait of girl from popular cartoon for children. It is Monster High Draculaura badge embroidery design. Dark color of background fabric perfectly combines with embroidery sample. Now work piece is almost ready. Author just need to remove it from hoop and iron. Then it can become part of clothing or stylish accessory for child or teenager. This is interesting perspective of pretty leather cover which let us examine it in all smallest details. It is cool work piece made by Leather idea from durable practical material using contrast color scheme. Center of composition is Owl dreamcatcher embroidery design 2. It is original version of popular Native American souvenir based on figure of colorful forest bird in hoop. 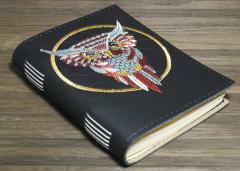 This is cool leather cover prepared by Leather Idea for pretty little notepad. Anyway you can use this idea for your tablet PC, passport or other document, book or anything else. Just don’t forget to embellish its front side with nice picture. For example it can be Owl dreamcatcher embroidery design 2. This is portrait of funny owl in hoop. Gosh I have been looking at some lovely designs here but unfortunately most are bigger than 4x4 as that's the only hoop my machine uses. This is nice interior décor which is easy to be made by your own hands. The only things you need are embroidery hoop, colorful threads and some patience. 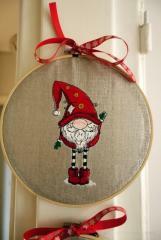 You also will need our Gnome in red phrygian cap and boots embroidery design. Using these simple things you will be able to create same nice accessory – or your own one. 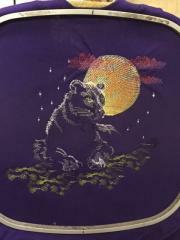 Download here: Author: Marianne Lynne King Author comment: " This is the latest of my embroidery projects. This is a free embroidery design. 352 minutes stitch out time. Well Worth it!! Thank you Ignor for this free designs. This is the 1st design of yours that I stitched out. 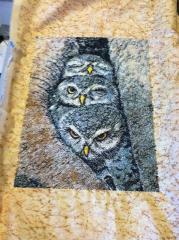 Haven't decided yet what I will do with the owls. Maybe frame. I want something to put on on a back of a hoodie but not sure what. This embroidered picture of traditional Japanese geisha is almost ready: the author just need to remove it from the hoop and iron. used for this picture is looking very expressively on the beautiful purple color which reminds the shade of burgundy wine. The image shows all the famous details of the geisha’s portrait — from blue sticks in her hair dress to the pose of folded hands. This is original and cute hand made interior design. It is executed by Pendant la sieste from rough natural material placed into round wooden frame and decorated with small bow. 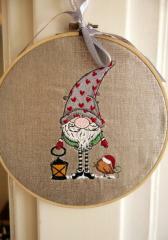 But its main highlight is Gnome in phrygian cap with hearts holding lantern embroidery design. This embroidery sample is multifunctional: you may use it both for Christmas and Valentine’s day because of little hearths on gnome’s cap. Horse heart free machine embroidery design Author: Ruth Theriault Author comment: "My next bag collection!" On this picture there is Lady with dog free embroidery design perfectly made by Audrey Dennill Venter‎. This picture is made in calm color scheme: dark hair of lady is one bright detail on it. Due to this solution and style of woman’s dress she looks like Greek goddess from ancient legend. It is difficult to believe that it is not fresco but just embroidery. 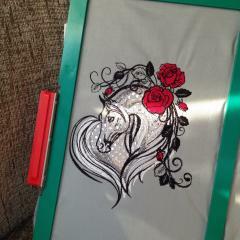 Right now Mosaic horse embroidery design in hoop. Test embroidery in kitchen serviette. Embroidery machine speed around 400 stitches per minute. With custom embroidery, your clothes will be exclusive! Computer embroidery on clothes is one of the most affordable ways to decorate things with beautiful and original patterns. The image for embroidery on clothes to order can be made in any technique - from ordinary embroidery by satin stitch or cross to creating complex patterns and techniques using cords, ribbons, rhinestones, cutting. Computer embroidery on clothing can be applied to any fabric, leather, suede, canvas and non-woven materials. Using a computer embroidery for drawing a pattern on a finished product or a cut, you can create original and stylish things.